1. Broadened theoretical concept of measuring inequalities and in evaluating the magnitude of inequality. Time, besides money, is one of the most important reference frameworks in a modern society. People have memories of the past and expectations about the future; they compare over many dimensions and over time. The observed distance in time (the number of years, quarters, months, etc.) for given levels of the indicator is used as a temporal measure of disparity between the two series, in the same way that the observed difference (absolute or relative) at a given point in time is used as a static measure of disparity. This innovation opens the possibility for simultaneous two-dimensional comparisons of time series data in two specified dimensions: vertically (standard measures of static difference) as well as horizontally (Sicherl time distance). In the information age this new view of the existing databases should be evaluated as an important contribution to a more efficient utilisation of the existing data. 2. Time matrix presentation format indicates at a glance that GDP underestimated the scale of damage of the financial crisis, showing the importance of ‘beyond GDP’ initiatives for policy debate. Time matrix organises the same data from Eurostat databases in a way that data are arranged by selected levels of indicators showing in which year these levels of the indicators were achieved by given country. The result is a LEVEL-TIME MATRIX, which is easily understood by everybody. This presents a first level visualisation that usefully complements the details in the original database by showing the easily understandable summary dynamic overview. The study ‘European Union at a Glance’ allows for a quick level comparison for time matrices for 30 selected indicators for 28 countries. 3. 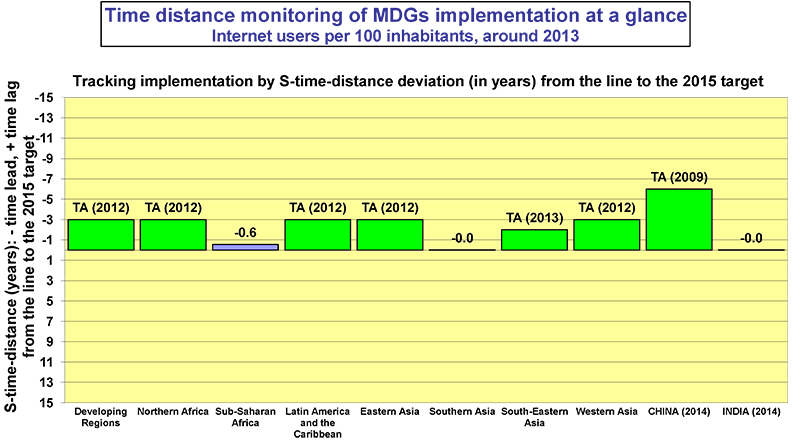 Time distance measurement for monitoring of implementation of targets and for goodness-of-fit. It provides new parallel system of monitoring implementation of targets based on deviations in time of actual values from the time on line to the target, complementing (not replacing) the existing mostly static measures of inequality and of implementation of targets. Expressed in time units, S-time-distance is easily understood by policy makers, managers, media and general public, thus being an excellent presentation tool for policy analysis and debate. Empirical part shows time distance deviations for implementation of five selected headline indicators towards the EU2020 EU and national targets. The Gaptimer progress chart is a clear example of simplicity with the summary story of about 150 cases of EU2020 targets. The additional time distance monitoring supervision can be a standard procedure also in numerous other activities of the Commission and of the national and local levels in hundreds of cases like monitoring and evaluation implementation of budgets, plans, projects, structural funds, etc. This presents a complementary possibility to look at indicator differences in the parallel universe of time, adding new vocabulary in the semantics of discussing and analysing differences in the real world.